When Burt Jones (the site’s administrator) asked me to share a few thoughts regarding why I like to keep returning to Raja Ampat. I thought that should be easy, but as I started to type I realized I could list dozens, perhaps hundreds, of reasons. But at the core of my thoughts is the fact that I am a wildlife geek. I love to observe and photograph the creatures I encounter. It doesn’t matter to me if the animals are big or small, more likely to be seen during the day or at night, shallow or deep, be they common or rare. I love to dive and to explore the marine wilderness. 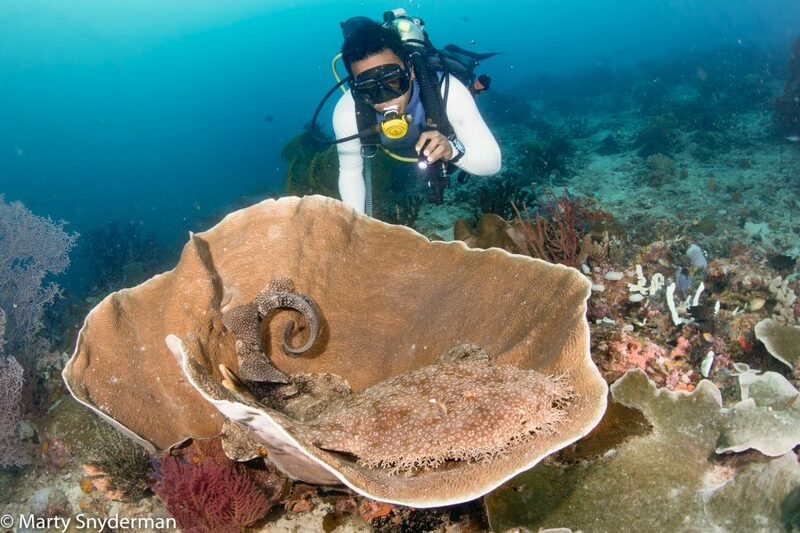 In that regard, Raja Ampat, aboard my preferred liveaboard dive boats Damai I and Damai II, is as good as it gets! Below you will find a selection of images from Marty’s most recent visit to Raja. Enjoy and, at the next opportunity, make sure to thank Marty for sharing with us. 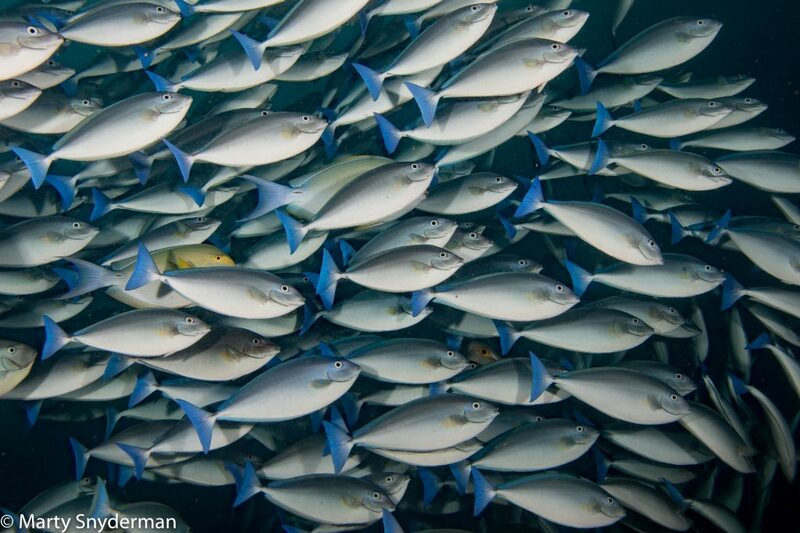 A school of Bluetail Unicornfish captured on a late afternoon dive at Cape Kri, one of the iconic, not-to-be-missed, sites in Raja Ampat. A diver checking out a resting Tassled Wobbegong shark. The animal is a mature male that is roughly five feet long. I had seen a number of tassled wobbes on previous trips to Raja Ampat, but this past trip in the northern islands I lost count of how many I saw. 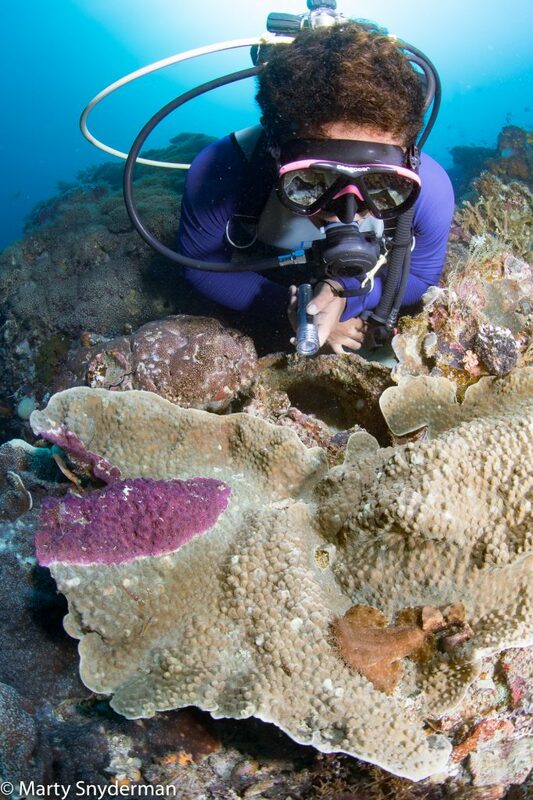 Here a diver is checking out a baby Tassled Wobbegong shark. My guess is that the shark is no longer than 14 inches, perhaps shorter. 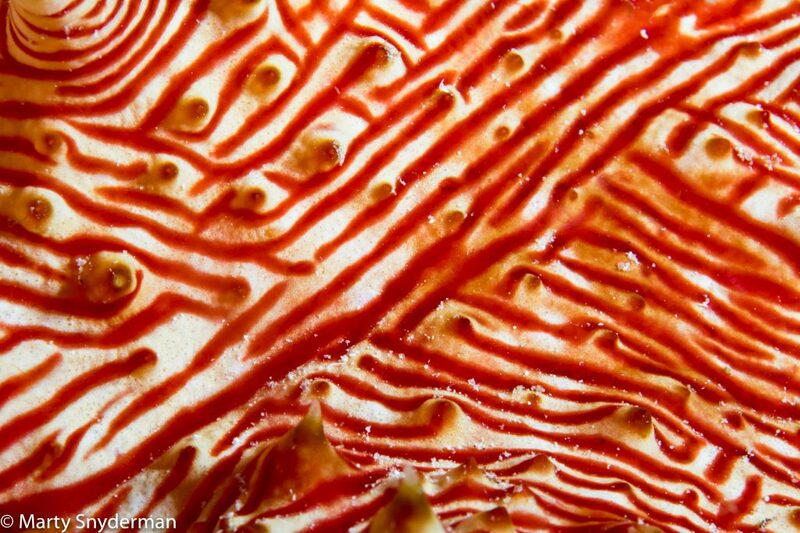 I like to photograph patterns in nature, and the skin of a “Candy Cane” sea cucumber provides great subject material for this type of shot. 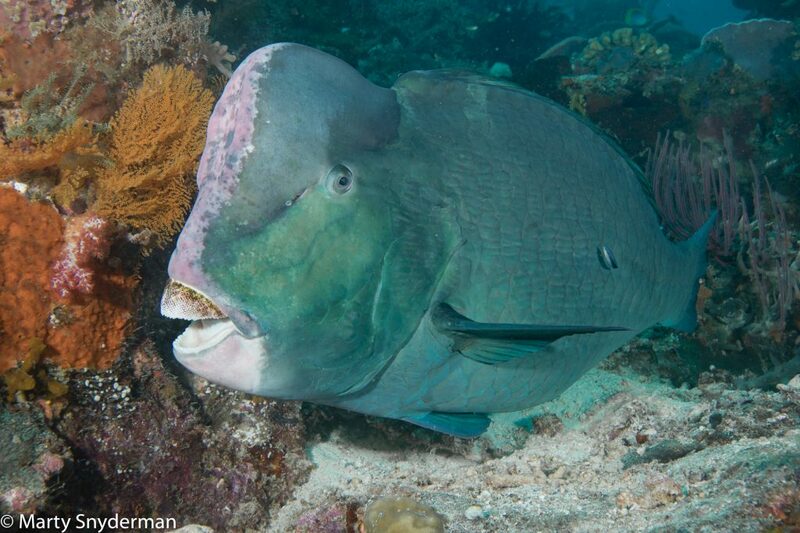 A big Bumphead Parrotfish, another late afternoon shot from Cape Kri. The parrotfish was feeding on the coral while getting cleaned by a wrasse. 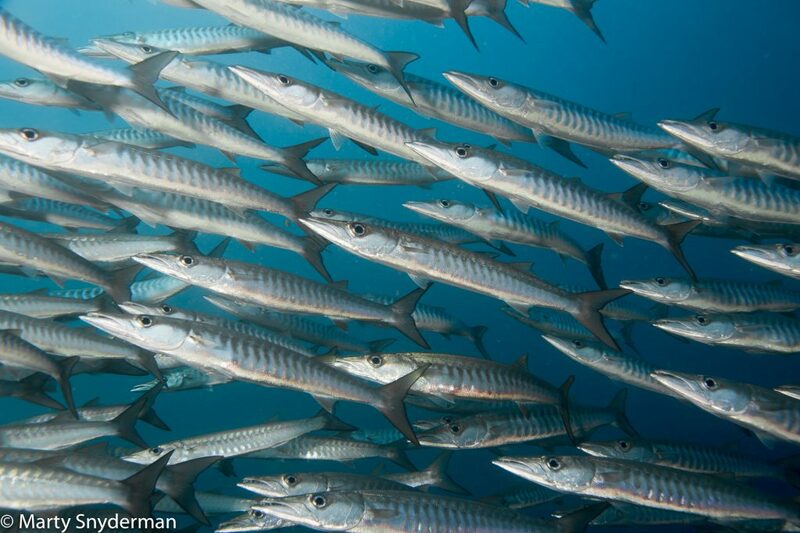 A school of Chevron Barracuda from one of two afternoon dives made at Cape Kri during my recent trip to Raja Ampat aboard Damai II. 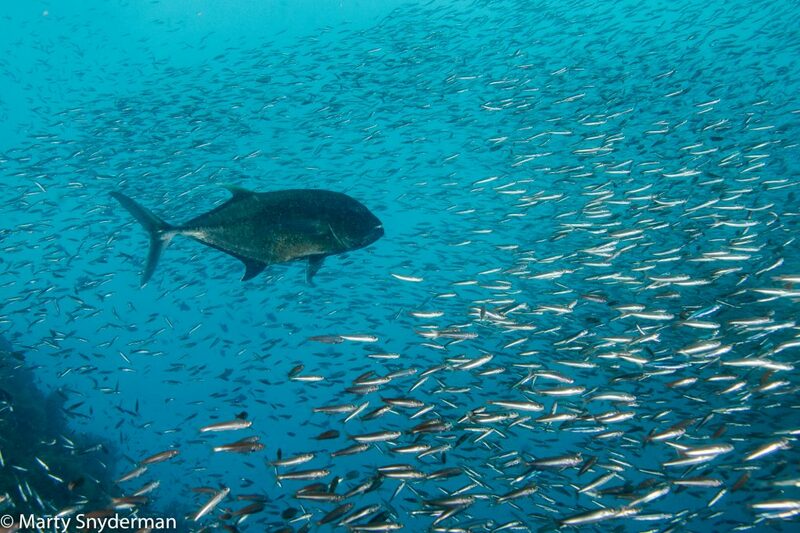 A Giant Trevally making a run at a school of anchovies. What can I say, except that bait balls are exhilarating, but not uncommon in Raja Ampat. A hunting Flamboyant Cuttlefish. I have been chasing this image for years. 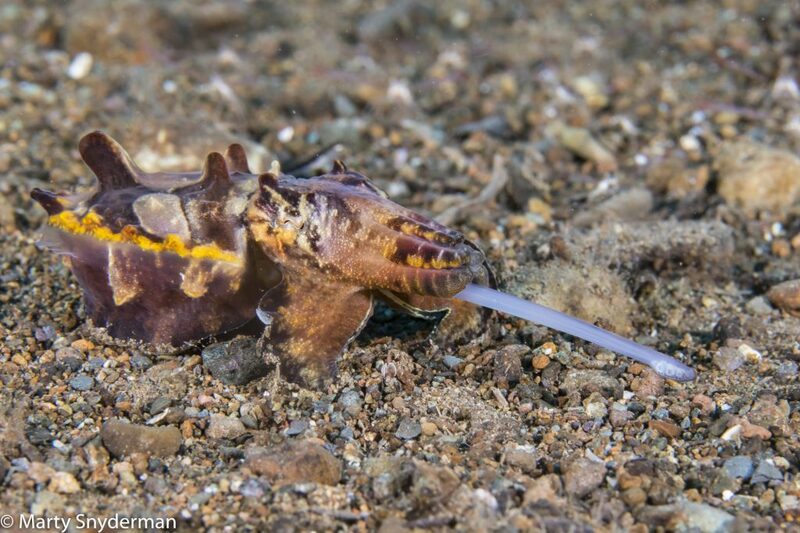 The cuttlefish is pausing for a moment as it prepares to strike, and an instant later it clubbed and grabbed its victim, a small, almost transparent shrimp. Marty Snyderman is a longtime still photographer, author, photography instructor, and speaker specializing in the marine environment. Marty’s still photography has been used by the National Geographic Society, Nature Conservancy, National Wildlife Federation, Oceana, Shark Research Institute, and many major publications, natural history museums and aquaria. And he just won the 2018 NOGI award, which is considered the “Oscar of the ocean world”. To view more of Marty’s work and learn more about him, visit his website, Marty Snyderman.